I made this calculator to help work out how big the image from a vsfx style projector will be on a cyc. It's easy to work out how wide the image will be in the middle of the beam, but it's often useful to know what width you will have at the top and bottom of the cloth so that you can avoid gaps and/or overlaps. This calculator tells you that, and also how much of the total beam is actually hitting the cloth (so you can avoid hanging positions which fill the desired space but with an inefficent amount of the light). This calculator uses data from the beam spread table and lots of maths. I haven't conducted extensive empirical testing to check how accurate it is, and accept no liability whatsoever for its predictions or your use of them. That said, the predicted results of the hanging poisitions on the show I made it for did turn out about right in practice. Note that the calculator allows you to adjust the vertical pitch of the projector by altering the aim height but assumes that you will point the projector directly at the surface on the horizontal axis (i.e. no turning to the left or right).If you get an invalid result for the top or bottom width, it means the beam doesn't hit the cloth at that height. New version! Now allows you to specify a beam angle, and the beam ratio gives more useful results. Planning how many projectors you need to fill a given width. 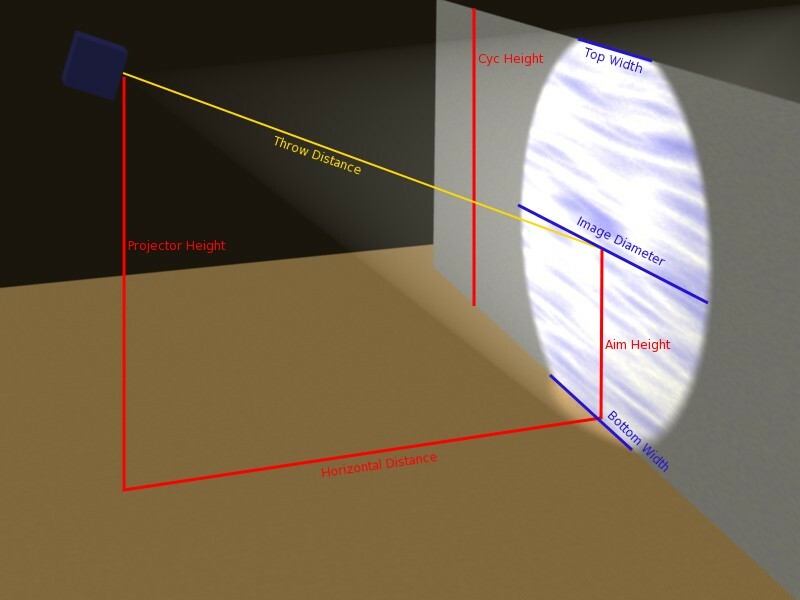 All dimensions are in metres apart from the lens size, which is in inches. Projector height	 All heights are from the floor! Cyc height	 How high is the top of the cyc? Horizontal distance	 How far is the projector from the cyc bar? Aim height	 The height at which the middle of the beam hits the cyc. Image Diameter	 How wide the image is at the aim height. Top width	 How wide the image is at the top of the cyc. Bottom width	 How wide the image is at the foot of the cyc. Beam Ratio	 What proportion of the image is visible on the cyc.